By the time Spencer Meyer joined the Mitchell Center’s Sustainability Science Initiative (SSI) in 2010 as a Ph.D. student, he had already been working at UMaine and with large forest landowners for a total of eight years in a variety of capacities. But always at the heart of his work was forest management and planning and land conservation. Today, Meyer is a senior conservationist at Highstead—a Connecticut-based regional conservation organization dedicated to conserving the forested landscape of New England—and a partner in the Sebago Clean Waters (SCW) initiative, which seeks to protect water quality, community well-being, and the health of fish and wildlife in the Sebago watershed through voluntary forestland protection. The SCW is an emerging water fund that links water users in the greater Portland region with those landowners in the watershed who help produce the pristine water and, notes Meyer, “is one way we’re envisioning bringing new attention and new resources to the challenge of conserving our critical forest resources.” Forests produce clean water by filtering out pollutants, keeping soil intact, reducing erosion, and reducing nitrogen and phosphorus pollution. “Together with our superb partners, we’re developing the business and community case for protecting these critical forests to ensure lasting water quality for the 200,000 Maine residents who get their drinking water from the Sebago watershed,” says Meyer. Indeed, the Portland water supply has what’s called a filtration avoidance waiver from U.S. Environmental Protection Agency, which means the watershed is so healthy that no prefiltration has to be done before final treatment with ozone and ultraviolet light. Sebago is one of only about 50 watersheds nationwide with such a waiver. In his talk, Meyer will also touch upon his work with the Wildlands and Woodlands (W&W) initiative, which he co-authored. The W&W initiative envisions a future where New England’s landscape is permanently protected to ensure continued supply of clean air, water, natural resources and outdoor recreation opportunities, as well as the healthy ecosystems that plants and animals need to thrive and adapt. “while I was a graduate student in SSI I had a chance to review and comment on the draft report.” Meyer had worked previously with some of the authors and looked up to a few of them as career mentors. 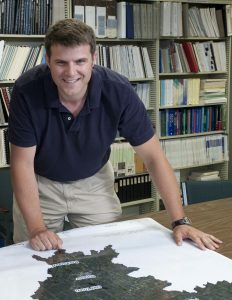 Throughout his time at UMaine, Meyer notes, he worked with diverse audiences including large forestland owners, conservation NGOs, state agencies, individual landowners, and fellow researchers. All that experience came to a head in his time with SSI, where he and colleagues brought many of those perspectives together in one major project. That effort—to combine land use planning, natural resource management, and conservation—culminated in the Maine Futures Community Mapper. Meyer, along with fellow Mitchell Center graduate student Michelle Johnson and their faculty advisors Rob Lilieholm and Chris Cronan, was awarded the UMaine 2014 President’s Research Impact Award for his role in developing the tool. “I’m still using that web-based tool in my work today. Indeed, much of the data and mapping we produced through the Mapper project is being used now for identifying high-value conservation targets in the Sebago watershed. We’re completing the life-cycle of sustainability science: from stakeholders, to research, to solutions, back to stakeholders. My work with the Mitchell Center prepared me to do the work I do now,” Meyer says.